Review: Dragon! The Coming of the Dragon is written by Rebecca Barnhouse and it is not part of a series. The main character is Rune. The Coming of the Dragon is encouraged by the epic tale of Beowulf, and it takes place in the Kingdom of Geat which is the place in the epic poem of Beowulf. The Coming of the Dragon contains old English names and it is intended for readers' aged 14 years and younger. Rune is a child who is thought to have a curse that will bring trouble to the kingdom of Geat. A stranger has awakened a dragon in the mountain and the villagers blame Rune for the bad luck. They thought Rune is an offering to the god when he was a baby found in a basket in the ocean. To them, it is wrong to save an offering. Amma, a foreseeing woman, somehow knew Rune is not an offering. The kingdom's people did not agree but, King Beowulf agreed to keep him. Now since the dragon has come, someone has to stop it. This dragon cannot be defeated by Beowulf alone. Who will the successor be if King Beowulf dies? I thought The Coming of the Dragon was an okay book. I liked title of the book. It really suited the book. I first thought there would be only action and a little suspense. There is also romance in it. So if people like a little romance The Coming of the Dragon could appeal them. There if there were pictures in the book, I could visually see the characters. There was not very good description of characters and dragon. The descriptions of the characters were okay but, they were not described overly well, but they were not described horribly. In the end, I kind of liked The Coming of the Dragon. We would like to thank Random House for providing a copy of The Coming of the Dragon for this review. 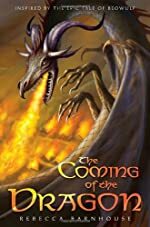 Have you read The Coming of the Dragon? How would you rate it? This is a good book. but, I have to disagree with you. i personally think that the characters were described quite well.